The reason we use the 0-255 color scale is because of 8 bit images. For a long time an artist could only give a pixel 256 tones of the three primary colors. With 8 bit technology becoming less used the 0-1 (0% to 100%) value system is starting to become the norm. This scale isn’t dependent on a bit format as 8 or 32 bit can all share the same percent value. Only the increments inbetween the (Bit Depth) are different. One 1 bit can store 2 values 2 tones of Red. 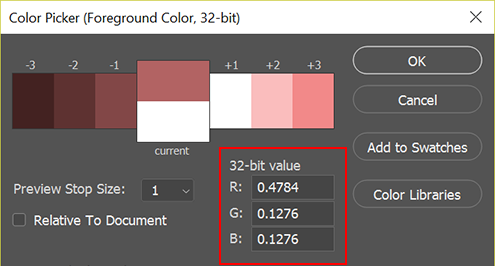 One 2 bit can store 4 values 4 tones of Red. One 4 bit can store 16 values 16 tones of Red. One 8 bit can store 256 values 256 tones of Red. One 16 bit can store 65,532 values 65,532 tones of Green. One 32 bit can store 4,294,967,296 values 4,294,967,296 tones of Blue. Three 8 bits ( 255 Red, 127 Green and 10 Blue ) creates a 24 bit depth file. Four 8 bits ( 255 Red, 127 Green, 10 Blue and 50% Alpha) creates a 32 bit depth file. Three 32 bits ( 0.75 Red, 0.25 Green and .10 Blue ) creates a 128 bit depth file. 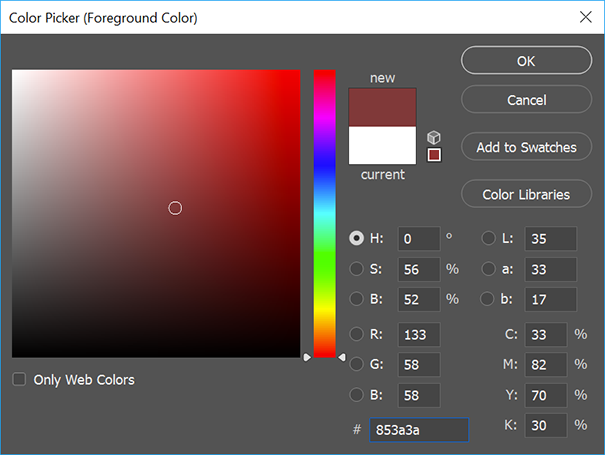 Some file formats only use RGB other use RGBA. 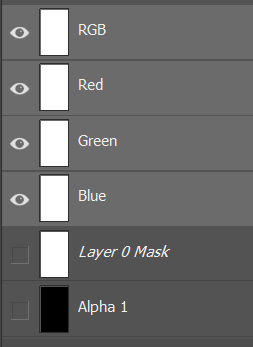 Rarely do image files have more that 4 colors/values. 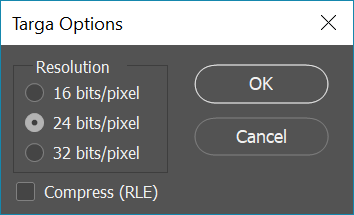 Jpeg only allows 3 bits per pixel [ Red, Green, Blue, ]. TGA allows 4 bits per pixel [ Red, Green, Blue, Alpha]. PSD sorta allows 5 bits per pixel [ Red, Green, Blue, Alpha, Masks, and Transparency].